Margaret River’s premium 2 bedroom, 2 bathroom, self-catering apartment accommodation conveniently located in town but a quiet step back: includes free wifi, entertaining balconies and secure private parking. 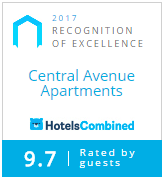 Central Avenue Apartments offer stylish 4.5 star self-contained accommodation minutes from Margaret River’s main street. The five 2 bedroom apartments are contemporary in style showcasing local artwork and luxury furnishings, creating an intimate environment and a modern alternative to more traditional Margaret River accommodation. If you are planning a romantic weekend escape, a small group getaway or self-catered family holiday you will find our premium facilities offer comfort and convenience. All apartments offer free wi-fi internet, spacious living, quality home entertainment, large balconies, king sized beds (singles can be arranged) and separate bathrooms for each room. Secure car parking is also valued by guests. Margaret River’s shops, restaurants, bars, cafes and breweries are just minutes away making the town’s vital street culture and culinary delights easily accessible. Being central to iconic wineries, beaches and forest walkways makes the apartments perfect as a step-off point for exploring the Margaret River Region.